High season / weekend prices apply on public holidays and Estonian school holidays (2019: 25.02-03.03 / 22.04-28.04 / 12.06-31.08). The Atlantis H20 Aquapark is connected to Tallinn Viimsi Spa and Sauna Center via a gallery. For an additional fee visitors to the Aquapark will be able to enjoy various spa and sauna pleasures (7 saunas, spa pools, children pools, 25m swimming pool). The additional fee for the Spa and Sauna Center is 5 € per person from Monday to Thursday and 7 € per person from Firday to Sunday. Family ticket is valid for 2 adults and 2 children up to 15 years. 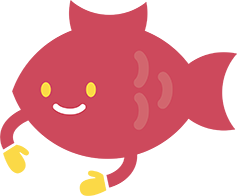 Weekend prices apply on public holidays, Estonian school holidays (2019: 25.02-03.03 / 22.04-028.04 / 12.06-31.08) and summer season. Weekend prices apply on public holidays and Estonian school holidays (2019: 25.02-03.03 / 22.04-028.04 / 12.06-31.08). Discount price is valid for kids from 6 years old of age and 1,20 m in height, for ISIC-and ITIC-card holders, for holders of valid Viimsi SPA Sports Club 10x and monthly membership cards. A child between the ages of 0-5 may enter the Sauna Center free of charge with a parent who has purchased an AQUAPARK+SAUNA ticket. Children under 12 years of age may only enter the park in the company of an adult chaperone who is responsible for the children for the duration of their stay at Aquapark. Children under 1,20 m may only use the Blue water slide together with an adult chaperone. Mon-Thurs, Fri morning 10 € + 1 free chaperone for every 10 students. Fri evening, Sat and Sun 13 € + 1 free chaperone for every 10 students. 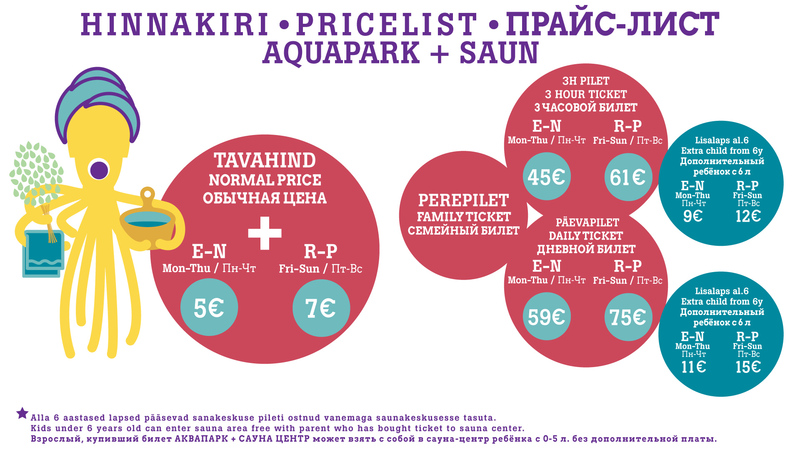 For a period of one week, you will receive a 20% discount on one regularly priced Viimsi Cinema ticket with an Aquapark ticket. For a period of one week, you will receive a 20% discount on one regularly priced Atlantis H2O Aquapark single ticket with a Viimsi Cinema ticket. The Atlantis H20 Aquapark is connected to Tallinn Viimsi Spa and Sauna Center via a gallery. For an additional fee visitors to the Aquapark will be able to enjoy various spa and sauna pleasures. The additional fee for the Spa and Sauna Center is 5 € per person from Monday to Thursday and 7 € per person from Firday to Sunday. Special offer for Tallinn Viimsi SPA registered hotel guests: unlimited visit to Atlantis H2O Aquapark during whole stay. 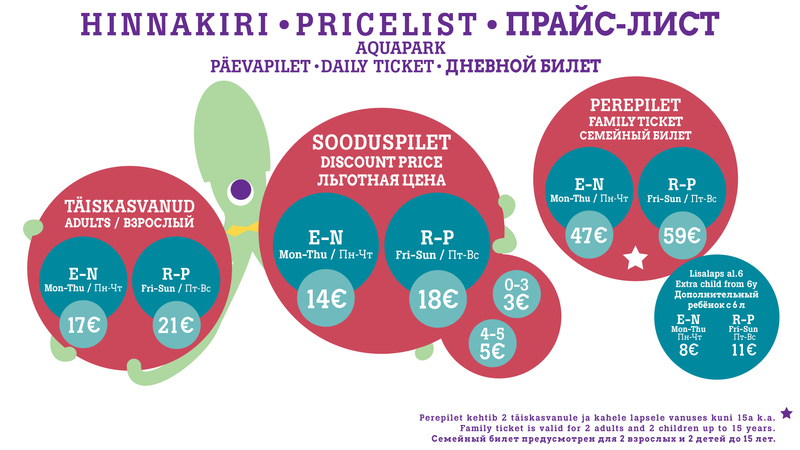 A child between the ages of 0-5 may enter the aquapark free of charge with a parent who has purchased a ticket. Unlimited access to Atlantis H2O Aquapark during whole stay from Monday to Thursday for 5 €/person (from 6 years) and 15 €/family (2 adults and 2 children until 15 y.) and from Friday to Sunday for 10 €/person and 25 €/family.